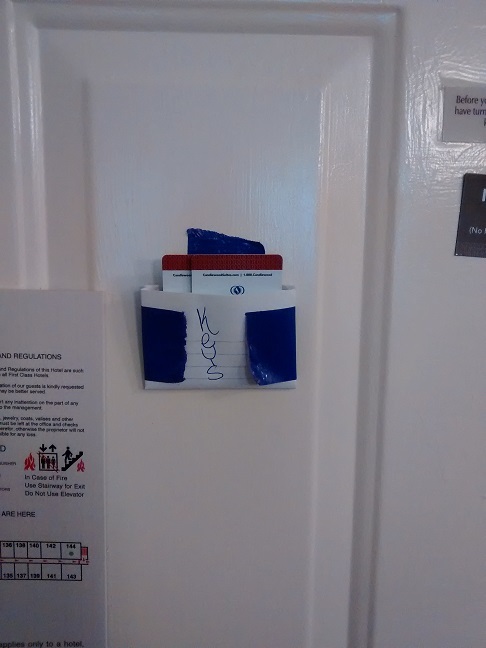 This was our solution for the game of hide and seek we kept playing with our hotel keys. We folded a piece of paper to make a pocket, then attached it to the door with duck tape. Problem solved. We held out as long as we could. We stayed in our house in Bossier City until the weekend before Diva started high school in Houston. It wasn't our ideal way to move but being a frugal household, we were not about to take on a second mortgage. Our house had been on the market since April and with no prospects on the horizon we decided to live in a long stay hotel. About a month before we moved into our temporary home, Engineer and I joked about hoping we all still loved each other after living in a 300 square foot suite for 45 days...or more. Three people and three dogs in a 3 room suite for a month and a half....or more...Lord help us. Diva and I just kept saying, "It will be an adventure!" Living small is not just about tiny house dwellers but for long-term hotel guests like ourselves, as well as for those who travel around in a camper. Over the next few weeks, I want to give you a few tips on living small successfully and without losing your mind. Some tips will be more pertinent to long-term hotel guest than other situations but hopefully there will be some useful information in there for everyone. Menu planning and cooking, living with dogs, keeping your family dynamic intact, and utilizing everything your location has to offer will be some of the topics covered. Today though, I want to give you the biggest and best tip that can and should begin to be implemented before you arrive at your destination: make a plan. I have always been a list person, but when you have so many living beings in so little of a space, planning and preparation are vital. Meals - More detail will be given in another post, but please know that menu planning is great anywhere you live and in any circumstance, but when you are tight on space, a menu plan is a must. It keeps you from having to go out to eat all the time (cha-ching!). Route - We moved into our current temporary residence right before school started. I had to find the best route to school as well as an alternate one in case the roads have standing water on them. It is worth spending time with a map, electronic or otherwise, to chart out the way to the grocery store, movie theatre, nail salon, pet store, etc. Don't discount the knowledge of locals either. Escape - This is twofold: we are living in a hotel in Houston which means we need an immediate plan for a fire escape and an evacuation plan in case of hurricanes. Because you are in a different situation, you and your kiddos need to know the procedure for escaping in case of an emergency pertinent to your area. I know, it's not nice to think about, but it is very important. Days - So as not to die of utter boredom (housewives, I'm looking at you, my sistahs), put in place a schedule that works for you. Find a good day for you to go to the grocery store, library, or to simply explore your surroundings. Activities - I have found a few great online resources for the area and have put together some interesting outings for the family in the coming weeks. Chamber of Commerce websites, tourist bureaus, and local arts groups are good places to start. Shopping Trips - Whether to a grocery store or a big box store, a list is important all of time just like a menu plan. However, when you are living where space is at a premium, you don't want to be tripping over bags of things for which you don't have space. Going back to the route planning thing, in more metropolitan areas, traffic can get horrendous (yes, I'm talking about you, Houston) so as not to spend more time on the road than at your desired destination, plan an efficient route accordingly. Wardrobe - Decide what clothes you're going to need for the duration of your stay - church clothes, uniforms, work out gear, etc. In most situations, you'll be able to do laundry somewhere, somehow. Again, I'm thinking of space; you only have so much room in the drawers and cupboards provided. I tend to hang (or fold) our clothes in outfits so that they are easy to grab and go and conserve space. Must Haves - When we were packing, I gave everyone the option to bring a few "can't live withouts." True to form Diva brought an arsenal a collection of books, Engineer brought safety goggles, and I brought a cast iron skillet. All of those items have come in handy and we are glad we brought them. #1 Tip - Bottom line: make a plan! Life's handed you lemons, you're making lemonade. I love your spirit, your positive attitude ... and that you're sharing your learnings with us. Believe me, I'm listening! Thanks so much Ms. Linda! We are learning a lot as we go.